When does Christmas start for Online Retail? When does Christmas start online? If you ask yourself this question at this time of the year and expect to cash up on the annual shopping frenzy, it is probably a little too late. Each year it seems that Christmas is starting earlier and earlier. This year, I have noticed both online and offline Christmas-themed stores as early as mid October. While it might look a bit odd from some, marketers love Christmas! It is the time of year, when consumers are spending more than they should on things that they do not really need just because it is Christmas. From family gifts to office Kris Kringles, Christmas is when we spend big bucks! According to the Australian Retail Association, the six weeks prior to Christmas 2007 recorded a $36.5 billion spent in Australia, with $800 Million spent just on the 25th December. Looking at these figures, it makes a lot of sense for marketers and retailers to try to extend this period and cash up on the Christmas spending frenzy. Black Friday, Cyber Monday, When does it really start? Most retailers consider that the Christmas season starts to kick in the six weeks prior to Christmas ( 25th December), which implies a start on the second week of November. Looking at the share of weekly online traffic in all categories over the last 4 years in Australia provided by Hitwise (see below), it appears that the starting point of the Christmas period is actually the first week of November. The heaviest part of the Christmas season (especially in the US) starts on Black Friday(Friday after Thanksgiving) for "physical" retailers and on Cyber Monday, which is the Monday following Thanksgiving (usually the first Monday in December). What to expect for Christmas 2008 ? Christmas 2007’s spending was a 10 years record. 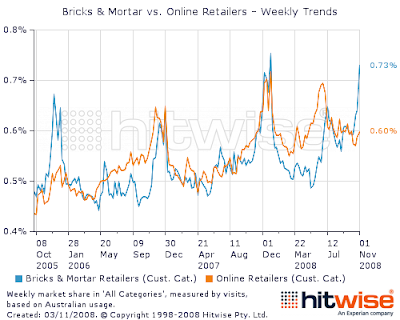 Some online retailers have recorded increases up to 30% compared to 2006. With a fast growing Australian economy, low employment rate and tax cut, last year’s Christmas season was set to be a great success. In 2008, the context does not seem to be as pleasant. The economic downturn, the crash in the share market and the uncertainly about a possible recession does not make people want to spend. Even if the interest rates and petrol prices are low, the consumer confidence is pretty low. While many experts are quite pessimistic about the outlook for Christmas 2008, it seems that the first results are actually quite promising. According to Alan Long, the research Director at Hitwise, the first week of November has shown a 3.14% increase in the share of visits compared to last year. comScore has released the online spending results in the US for the first week of December and the online sales are actually 9% higher than the same period last year. comScore Chairman, Gian Fulgoni is however cautious as the overall Christmas season results will highly depend on what happens in the next few weeks. Overall, comScore estimates that the online sales in the US will be similar if not a little higher than last year (US$ 29,200 M for 2008 versus US$29,169 for 2007). If Australia follows the same trend as US, it would mean that 2008 will equal 2007, which is a pretty good results considering that 2007 was a 10 years record! From past experience with a physical retail shop front most importers will start receiving their indented Christmas stock orders in late September, early October and will get it into the shops very quickly (October). We used to start our Christmas marketing as early as October and have people flooding through the doors. I would imagine the online Xmas retail market is no different. My stock is no longer Xmas related but I do find orders being received for 'presents' up unto the last few days. Now, I want to see the actual results of vacation sale, in your new post. Ofcourse, with indepth analysis, that you do always.